At a time when America had only just begun its journey away from the discriminatory Chinese Exclusion Acts of the 1880s and toward its eventual alliance with China during World War II, a group of home economists from Oregon began to contemplate sending one of their own to China. Ava B. Milam, head of the Department of Home Economics at the University of Oregon, left for Yenching University in 1922 to design a home economics program uniquely tailored to Chinese culture. In the 1920s, ideas of western superiority flourished, and work in China was largely considered as valuable in reflecting the promise of American society. Ava B. Milam and Caroline Chen, a student from Yenching, China. While Milam, and others like her, showed influences of American orientalism, they veered significantly from the masses by expressing a scientific appreciation for many Chinese customs. As leaders in a progressive and highly scientific field, the home economists emphasized their scientific focus on the domestic sphere. Unlike the majority of Americans at this time, they felt that Chinese culture held scientific value apart from the West, and they considered the West to be far from perfect. The aim of this paper is to examine the letters and memoirs the home economists left behind against the backdrop of American orientalism. American orientalism was a complex and multi-faceted ideology that remained wide-spread throughout early American history and into the 1900s. It involved imperialistic and often negative western stereotypes of the East. While scholars have advanced a variety of definitions of American orientalism, there is a general consensus that it resulted from modernity becoming synonymous with the West, meaning that "Asia embodied what historian Jackson Lears calls 'anti- modernism.' "2 A thorough examination of the divergence of the home economists' ideas from those of American society in general produces an image of the unique form of American orientalism expressed by American home economists who travelled to China. In this paper, I present a historical case-study of a group of women often overlooked, especially in discussions of orientalism. In conducting this research, I find that the unique interaction between American orientalism and the values of the home economists produce a remarkable ideology for its time. This essay shows that home economists who moved back and forth from the United States to China between the 1920s and 1940s maintained elements of orientalism in their ideologies but diverged from the norm by prioritizing scientific ideas about home economics over the cultural practices of both Chinese and American societies. Furthermore, these women sometimes elevated Chinese culture over Western culture based on its level of congruence with scientific principles. In doing so, they countered the popular orientalist attitude in America that Chinese tradition was incapable of producing modernization. Milam, Mills, Mabel Wood, and Martha Kramer, the four home economists around whom this discussion is centered, all spent significant time in China between the 1920s and the 1940s while involved in the Yenching home economics program. While they spent most of their time in China, the home economists also frequently visited Japan and occasionally other parts of Asia on excursions. After returning home from their time abroad, some even went as far as to advocate the adoption of certain Chinese practices in America, and all four branched from the orientalist norm by finding value in the culture of China beyond mere fascination. Additionally, Wood and Kramer, who travelled to China after Milam and Mills in the mid to late 1930s, showed even more appreciation for Chinese customs. This shift fits with current research trends that show a transition to a more favorable view of an Americanizing China post-1931. That said, even the most negative of the home economists complimented Chinese culture for its scientific value at a time when complimenting the Chinese typically meant praising them for becoming more like Americans. Despite this negative perception, Americans possessed a clear fascination with the East that stood the tests of time and growing knowledge. "Exoticism," an idea within orientalism, represented this captivation with the "exotic" East.7 This fascination was not necessarily positive, and even when it was, it did not represent a preference for eastern culture over western culture. For example, common literature advised women decorating with oriental fashions to only use them as accent pieces.8 After all, the East was exotic and fascinating, but it was not meant to become the new norm. Around the same time, Chiang Kai-shek, who managed to unify China under his rule much to the delight of those in America, converted to Christianity. Changes such as these solidified China's place in the eyes of Americans as a country capable of demonstrating the promise of American society by westernizing and modernizing in accordance with American virtues and expectations.11 Leong described American attitudes in the 1930s by arguing that they saw China as "a demonstration of the promise held by American democracy and culture to transform other nations. "12 The decade was characterized by a positive view of an Americanizing China, with the understanding that China remained favored only because it was beginning to look more like America. The home economists, writing during this time, were exceptional for valuing the ways in which Chinese culture was more in line with their scientific values than American culture. In certain realms, they advocated for America to become more like China. During the time period the home economists worked, women reacted to China in a variety of ways including sympathy, emulation, exploitation, and even a combination of all of them.13 Still, any scientific or modern virtues found in China, they believed, necessarily came from the West, and little suggestion seems to have been made by most American women around this time period that China had anything with modern value to offer the West.14 In Yoshihara's discussion of American women and their relation to orientalism, she presents American Orientalist ideologies as comparisons between the feminized east and the modern west. For example, American actress Geraldine Farrar played the character of Japanese Cio-Cio-San in Madama Butterfly. Yoshihara notes that, "for those who praised Farrar's performance, the very difference between the modern American womanhood the singer embodied...and the quaint Japanese femininity she impersonated on stage served to validate her performance power. "15 References to the West were seen as synonymous with "modernity." Mari Yoshihara illustrated the growing connotation in her discussion of a writer who described Japanese art, "the writer of this passage saw "truth and simplicity, grace and harmony" in Japanese art...the antithesis of the art of the modern, industrial, civilized West. "16 The motivations and views of different American Orientalist discourses were a mixed lot that transformed throughout history, but they primarily rested on ideas of American superiority in which the West was scientifically superior to the East. This attitude was in contrast, of course, to the perspective brought back to America by the home economists around this time. While the home economists did at times express preferences for western culture, they also saw a great deal of modern value in Chinese domestic practice. 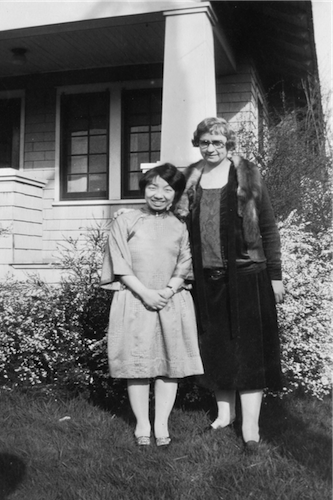 Mills was a student of Milam's at Oregon State College and she travelled to China with Milam in 1922. She spent her first year in China learning Chinese and then took over the development of the home economics program at Yenching University. Mills was in China from 1922 until 1931 and then returned again after her marriage to Knight Biggerstaff as Camilla Biggerstaff from 1934 to 1936 and from 1944 to 1949.19 Of the letters she left behind, most are from her earlier years. A few years after Mills left Yenching University in 1931, Mabel Wood came to the university in 1936 and stayed for a year to assist the head of the home economics department. Wood resided in China for only a year, but during that year she spent extensive time with the locals engaging with Chinese culture. She intended to take leadership of the home economics department, but instead felt it was wiser to allow Caroline Chen, one of Milam's former students and a native of China, to lead the department. Wood instead opted to provide her with support and advice. Judging by her actions, Wood elevated the position of the Chinese higher than her predecessors. When Wood left in 1937, Martha Kramer took her place. Martha Kramer spent around six of her eighty-seven years living in China.20 In 1937 she left the United States to work at Yenching University and did not return from China until 1943. As the author of a paper claiming that, "many and many an idea could be brought right over [from China] to food preparation in this country," Kramer was perhaps the strongest advocate for the adoption of Chinese customs in America. While in China during World War II, she was placed under house arrest and was later interned at Weihsien until American soldiers liberated the camp and she was able to return home. Despite her internment, she went on to write many favorable articles about China. Each woman possessed a clear fascination with China, a fascination admittedly influenced by elements of exoticism in the American orientalist rhetoric. Exoticism had both positive and negative connotations. A broad category, exoticism in American Orientalist ideologies included ideas of "otherness", ideas of the "heathen" East vs. the "civilized" or "modernized" West, and an aura of curiosity and fascination surrounding "exotic" eastern cultures.21 The representations of exoticism in the writings of the home economists, however, proved to be overwhelmingly positive. What was surprising, however, was that, at times, all four home economists believed Chinese culture to be more in line with their own scientific ideals than American culture. Dr. Helen Schneider argues that home economists began to adhere to a kind of "home economics superiority" which explains their distance from widespread ideas of cultural superiority.23 Therefore, while not altogether exempt from the influences of orientalism, the home economists were exceptional in their acceptance and appreciation of many aspects of Chinese domestic culture for their scientific advantages. The nature of their role in American society put them in a unique position relative to their peers. They had less cause to over-idealize America, having found so many flaws within American domestic culture. Additionally, while many other American women exploited the East to gain spheres of influence for themselves, the home economists had already found a niche of power within the American domestic sphere.26 With an avenue for gaining influence already available in American society, they experienced less need to use their connections to the East as an avenue for power. Many factors set the home economists apart from other American women in relation to orientalism, but the context in which they lived still impacted their ideologies. The ideology of the home economists branched from traditional orientalism, but their writings still showed expressions of it, especially ideas of exoticism. In order for something to be considered "exotic" it must be compared to a standard. Their writings showed a clear image of China as an "other" to the West. Wang Ning elaborated on the idea of "otherness" in her work "Orientalism versus Occidentalism?" Wang described a notion of "otherness" as a condition for orientalist thought and as the means by which Westerners reflected on their own identity as the "other" of the "other. "27 Therefore, the notion of eastern "otherness" serves as a prerequisite for expressions of exoticism. An internal idea, "otherness" often manifested itself outwardly in the practice of making comparisons between the East and the West and thereby separating them. The home economists repeatedly compared China to the United States, noting things that appeared both similar and foreign to them. The separation of China and America in the minds of the home economists is evident in their ready acceptance of things that appeared unusual combined with their surprise at things that appeared familiar. Milam, for instance, compared and noted differences between many things such as open freight cars, which transported men, and Western cattle cars. She also compared the lengths of time that women nursed their babies in the East and in the West.28 Similarly, Wood noted many "foreign" things about China such as the camel trains that woke her up, the pigeon whistles, the water carts, and the "funny" rickshaw system.29 She even declared many things to be surprisingly similar by comparing the Chinese Moon Festival to Thanksgiving and Chinese houses to certain types of Western houses.30 During the middle of her trip, she investigated the differences between the problems in the East and in the West in supervising dormitory food. Expecting more differences, she marveled at the extent of the similarity. Kramer also made comparisons between the East and West. In one instance she noted how interesting the holidays seemed to her "foreign" eyes. These women used their knowledge of the West as a vantage point to cope with the new experiences found in the East. This line of thinking paved the way for the emergence of exoticism in their ideologies. In addition to illustrating exoticism in their descriptions of China, the home economists also demonstrated a penchant for exoticism in their purchases. Indulging the common American interest in exotic oriental goods, they bought a variety of Asian trinkets and clothing. Milam, for instance, bought a ceremonial kimono to send home during an excursion to Japan.38 Mills purchased a variety of things as well, including many gifts such as embroidery, fabric, and a luncheon set.39 Wood also bought gifts to bring home and discussed all the "junk" she had bought.40 In accordance with her fascination with both weddings and funerals, she purchased tiny figurines of Chinese wedding and funeral processions.41 Wood also bought a fair amount of Asian clothing. She got her mother a silk gown, sent home a kimono, obtained a modern Chinese dress, and bought most of a Chinese man's outfit. She also talked about wanting a traditional Chinese dress and a complete Japanese costume for fun. Wood even considered dying her hair to go with her outfits.42 On one shopping trip in particular, Kramer described her desire to buy "all kinds of intriguing things" such as rugs, temple objects, porcelains, pewter wine jugs, bronzes, and glass snuff bottles. She ended up restraining herself and purchased only one "set of red lacquer wine cups, lined with silver. "43 The home economists clearly saw China as an "other" and were influenced by the exotic orientalist discourse. However, they tended to view exotic things in a positive light, and, as we will see later, found scientific merit beyond mere fascination in many other aspects of Chinese culture. For the most part, the home economists did not appear to favor American culture over Eastern culture arbitrarily. Occasionally, however, they did make some statements that seemed to show they still believed the West to be generally superior, although not absolutely so. Milam and Mills, both writing mostly during the 1920s, expressed this type of favoritism more frequently than Wood and Kramer who wrote a decade or two later. For example, Helen Schneider noted a sarcastic note from Milam in one of her letters: "That nice habit [of smoking] our Western civilization has given China too. Don't think I'm cynical, please. I still prefer Western civilization. "44 This quote indicated that even though Milam knew that the West did not always have the best cultural habits, she still did not want to appear to prefer the East. Similarly, Mills wrote to her friend about a political advisor and repeated his assertions that it was a bad thing for the Chinese to drift away from American and French without objecting.45 Her comments certainly do not prove that she agreed, but it does seem likely that she would have mentioned any disagreements she may have had. In addition, Mills also compared Chinese trains to American trains, much preferring American trains.46 Milam and Mills seem to have shared a similar outlook, the West was generally preferable, but, as we will see later, not always. Wood and Kramer, writing about 10-20 years after Milam and Mills, expressed even fewer arbitrary preferences for the United States over China. Travelling post-1931, an even more favorable view toward China was not unexpected given the increasing negative American opinion of China. Kramer was almost entirely complimentary of Chinese culture. Wood, even when she did express a preference, did so in a way that showed a good deal of cultural awareness. For instance, on one occasion she planned to go with some of her friends to a concert of real Chinese music. She suspected she would not like it because it was monotonous "to one that doesn't know what it is all about. "47 Still, she defended the Chinese against someone who declared that they were not musical saying, "I don't see how you can say that just because it doesn't sound good to us. Bach and Beethoven wrote some pretty awful things to my way of thinking. So we'll go and be educated. "48 She even used the word "educated," which implied that she found value in the Chinese perspective. Then, after the concert, she wrote that she found it much more interesting than she had anticipated and complimented a traditional Chinese instrument for its beautiful tone.49 At one point, she also seemed to look down on Taoism, calling it a "queer belief. "50 Just a few days earlier, however, she described how impressed she was by the martyr-like faith of those who meditated.51 Even if she found the belief odd, she maintained a respect for it. Kramer made a few critical comments in her letters, but they were few and far between and were backed by a scientific reasoning. Besides these few comments, the home economists tended to look to their own ideals, rather than to American ideals, as the standard, especially in domestic realms. This line of thinking likely related to the relatively small amount of pure cultural preference found in their writings as compared to the standard American orientalist rhetoric. The home economists who traveled to China also criticized Western culture. For instance, Kramer criticized English eating habits, and Milam admired a leader in the movement of scientific motherhood, likely prescribing to some of the same ideas in relation to American childcare.61 No matter what culture they were researching, the home economists wanted to find scientific solutions to domestic problems. During Milam's time at Yenching, she conducted a survey to determine the specific needs of China for domestic science. What she found to be the four strongest categories of need coincided with the four most frustrating aspects of Chinese culture for the home economists as reflected in their letters. In a statement reflecting the results of her survey, Milam wrote, "Camilla and I felt that we could give the greatest help by teaching the fundamentals of nutrition, child care and development, household sanitation, and home management. In our teaching we emphasized proper diet for resistance to disease and for general good health. "62 The agreement between Milam's study and the problems with China that the home economists noticed first hand served to support the notion that the grievances expressed by the home economists came more from violations of scientific principles and less from notions of cultural superiority. In fact, home economists had complained about and criticized the same four types of problems in America as discussed above in the examples of sugar in American diets, scientific motherhood, the sanitation of the farmwoman's dishcloth, and the wastefulness of Americans. Poor home management and a lack of thrift and efficiency were other re-occurring themes in the frustrations expressed by the home economists. For the classroom at Yenching, Milam designed classes in home management. Kramer advocated for an educational effort to convince families to keep some of their homegrown goods, another attempt to improve home management in China.82 The home economists also noted the lack of the same skills such as efficiency and thrift among Asians in other areas of daily life as well. During her time in Korea, for instance, Milam commented on the custom of ripping apart skirts to clean them and then sewing them back together writing, "What a time-consuming activity! "83 Just as Milam found Korean laundry habits to be a waste of time, Mills found Chinese funeral costs, which could be upwards of ten thousand dollars for the rich, to be "rather a waste of good money. "84 Kramer discussed a few grievances that dealt particularly with matters of the home. She told one story proudly of a student who taught country dwellers to buy dried skim milk cheaply in bulk to supplement their diets, indicating a need for thrifty nutrition.85 While the home economists expressed a variety of criticisms of China, they did so on a scientific basis. Not only were their complaints scientifically minded, but also they were similar in nature to other complaints of home economists about American culture, indicating that their biases were largely not cultural. Kramer expressed a similar feeling stating that the U.S. soil conservation "folk" could learn some things from the Chinese farmers.102 She also commended the Chinese for their ability to find many good uses for things such as soy bean and lotus plants. In an article written about Chinese diets, Kramer wrote, "Americans could learn much from the Chinese about preparation of tasty and nutritious bean products. "103 In a discussion of lotus plants, she listed the various uses for the plant in Chinese culture including using the leaves for wrapping meat and covering jugs, making food from the roots and seeds, and even making sweets out of it.104 She even praised the use of peanuts in Shanghai as a "thrifty, nutritious, and pleasing addition. "105 All of her praises were high compliments coming from a home economist who prioritized those values above most others. A proponent of public anthropology and of history's power to influence modern society, Nancy Mason graduated from Virginia Tech in 2015 with an interest in the relationship between the East and the West, specifically relating to modern China. Apple, Rima. "Constructing Mothers: Scientific Motherhood in the Nineteenth and Twentieth Centuries." Social History of Medicine 8, no. 9, 1995. Cohen, Warren I. America's Response to China: A History of Sino-American Relations. New York, NY: Columbia University Press, 2000. Elias, Megan. Stir It Up. Philadelphia, PA: University of Pennsylvania Press, 2008. Fleishchmann, Ellen. "At Home in the World: Globalizing Domesticity Through Home Economics in the Interwar Years." In Transnational and Historical Perspectives on Global Health, Welfare and Humanitarianism. Edited by Ellen Fleischmann, Sonya Grypma, Michael Marten Kristiansand, and Inger Marie Okkenhaug. Kristiansand, Norway: Portal Books, 2013. Jespersen, Christopher T. American Images of China: 1931-1949. Stanford, CA: Stanford University Press, 1996. Knight Biggerstaff papers. Letters, Camilla Mills to Family; Camilla Mills to Thelma. Division of Rare and Manuscript Collections, Cornell University Library. Kramer, J.T. Aunt Martha's China. Decatur, IL: Abbott & Foran Inc., 1998. Leong, Karen J. The China Mystique: Pearl S. Buck, Anna May Wong, Mayling Soong, and the Transformation of American Orientalism. Los Angeles, CA: University of California Press, 2005. Milam, Ava B. & Munford, Kenneth. Adventures of a Home Economist. N.p. : Oregon State University Press, 1969. Schneider, Helen. Keeping the Nation's House: Domestic Management and the Making of Modern China. Vancouver, BC: UBC Press, 2011. Schneider, Helen. "The Professionalization of Chinese Domesticity: Ava B. Milam and Home Economics at Yenching University." In China's Christian Colleges. Edited by Daniel H. Bays and Ellen Widmer. Stanford, CA: Stanford University Press, 2009. Tchen, John Kuo Wei. New York Before Chinatown: Orientalism and the Shaping of American Culture 1776-1882. Baltimore, MD: The Johns Hopkins University Press, 1999. Wang Ning. "Orientalism versus Occidentalism." New Literary History 28, no. 1, 1997. Wood, Mabel. The China Letters of Mabel Wood. N.p. : H.J.F. Townsend, 1986. Yoshihara, Mari. Embracing the East: White Women and American Orientalism. New York, NY: Oxford University Press, 2003. 1 Jespersen, T. Christopher, American Images of China: 1931-1949, (Stanford, CA: Stanford University Press, 1996), 24. 2 Yoshihara, Mari, Embracing the East: White Women and American Orientalism, (New York, NY: Oxford University Press, 2003), 26. For further discussions of American orientalism, see Leong, Karen J., The China Mystique, Jespersen, Christopher T., American Images of China, 1931-1949, Yoshishara, Mari, Embracing the East: White Women and American Orientalism, and Tchen, John Kuo, New York Before Chinatown: Orientalism and the Shaping of American Culture, 1776-1882. 3 Tchen, John Kuo Wei, New York Before Chinatown: Orientalism and the Shaping of American Culture 1776-1882, (Baltimore, MD: The Johns Hopkins Unversity Press, 1999), 16-17. 4 Yoshihara, Embracing the East, 8-9. Warren I. Cohen, America's Response to China: A History of Sino-American Relations, (New York, NY: Columbia University Press, 2000), 30. 5 Jespersen, American Images of China, 2. 6 Tchen, New York Before Chinatown, 25. 7 Yoshihara, Embracing the East, 9-10. 9 Leong, Karen J., The China Mystique: Pearl S. Buck, Anna May Wong, Mayling Soong, and the Transformation of American Orientalism, (Los Angeles, CA: University of California Press, 2005), 28-29. 10 Leong, The China Mystique, 12. 11 Jespersen, American Images of China, 25. 12 Leong, The China Mystique, 1. 13 Yoshihara, Embracing the East, 3-197. 17 Schneider, Helen, Keeping the Nation's House: Domestic Management and the Making of Modern China, (Vancouver, BC: UBC Press, 2011) 122. 20 Kramer, J.T., Aunt Martha's China, (Decatur, IL: Abbott & Foran Inc., 1998), Introduction. 21 Yoshihara, Embracing the East, 8. 22 Jespersen, American Images of China, 24-26. 23 Working paper by Helen Schneider presented at Virginia Tech in October, 2014. 24 Schneider, Helen, "The Professionalization of Chinese Domesticity: Ava B. Milam and Home Economics at Yenching University," in China's Christian Colleges, ed. Daniel H. Bays and Ellen Widmer, (Stanford, CA: Stanford University Press, 2009), 127. 25 Elias, Megan, Stir It Up (Philadelphia, PA: University of Pennsylvania Press, 2008), 63. 26 Yoshihara, Embracing the East, 6. 27 Wang Ning, "Orientalism versus Occidentalism," New Literary History 28, no. 1 (1997): 58-59. 28 Milam, Ava B. & Munford, Kenneth, Adventures of a Home Economist, (n.p. : Oregon State University Press, 1969). 29 Wood, Mabel, The China Letters of Mabel Wood (n.p. : H. J. F. Townsend, 1986), 56, 57, 110. 31 Ibid., 48, 13. Milam & Munford, Adventures of a Home Economist, 155, 156, 187, 217, 220. Knight Biggerstaff papers, Letter, Camilla Mills to Family, March 4, 1923, box 25, #14-17-629. Division of Rare and Manuscript Collections, Cornell University Library. Kramer, Martha, Aunt Martha's China, (Decatur, IL: Abbott & Foran Inc., 1998), 5, 6, 7, 13. 32 Milam & Munford, Adventures of a Home Economist 187. 33 Knight Biggerstaff papers, Letter, Camilla Mills to Thelma, February, 3, 1924, box 25, #14-17-629. 34 Wood, The China Letters of Mabel Wood, 25, 28, 49, 102. 35 Ibid., 15, 25, 107. 36 Ibid., 14-15, 23, 49, 50. 37 Kramer, Aunt Martha's China, 10. 38 Milam & Munford, Adventures of a Home Economist, 157. 39 Knight Biggerstaff papers, Letter, Camilla Mills to Family, January 14, 1923, box 25, #14-17-629.: March 2, 1923, box 25, #14-17-629. 40 Wood, The China Letters of Mabel Wood, 87. 42 Ibid., 13, 42, 84, 99. Wood's suggestions of emulating eastern women is reminiscent of some orientalist expressions as discussed by Mari Yoshihara. Mari Yoshihara, Embracing the East, 10, 99, 195. 43 Kramer, Aunt Martha's China, 12. 44 Schneider, "The Professionalization of Chinese Domesticity," p. 137. 45 Knight Biggerstaff papers, Letter, Camilla Mills to Family, January 14, 1923, box 25, #14-17-629. 46 Knight Biggerstaff papers, Letter, Camilla Mills to Family, April 2, 1929, box 25, #14-17-629. 47 Wood, The China Letters of Mabel Wood, 25. 52 Fleischmann, Ellen, "At Home in the World: Globalizing Domesticity Through Home Economics in the Interwar Years," in Transnational and Historical Perspectives on Global Health, Welfare and Humanitarianism, ed. Ellen Fleischmann, Sonya Grypma, Michael Marten Kristiansand, and Inger Marie Okkenhaug, (Kristiansand, Norway: Portal Books, 2013), 161. 53 Elias, Stir It Up, 18. 55 Fleischmann, "At Home in the World," 176. 56 Ibid., 179. Additionally, while home economists generally tried to eliminate tradition in favor of more modern methods, the home economists who went to China endeavored to preserve many Chinese traditions, claiming that they were scientifically beneficial in the modern world. 57 Elias, Stir It Up, 20. 60 Apple, Rima, "Constructing Mothers: Scientific Motherhood in the Nineteenth and Twentieth Centuries," Social History of Medicine 8, no. 9 (1995): 161-162, 177. 61 Kramer Aunt Martha's China 2-3. Milam & Munford, Adventures of a Home Economist, 159. 62 Milam & Munford, Adventures of a Home Economist, 159. 66 Wood, The China Letters of Mabel Wood, 24, 123. 68 Knight Biggerstaff papers, Letter, Camilla Mills to Family, June 17, 1923, box 25, #14-17- 629; June 17, 1923, box 25, #14-17-629. 69 Milam & Munford Adventures of a Home Economist, 152. 70 Kramer,Aunt Martha's China, 1. 72 Milam & Munford Adventures of a Home Economist, 187. 73 Knight Biggerstaff papers, Letter, Camilla Mills to Thelma, February 3, 1924, box 25, #14-17-629. 74 Wood, The China Letters of Mabel Wood, 113. 75 Milam & Munford Adventures of a Home Economist, 156. 76 Wood, The China Letters of Mabel Wood, 116. 81 Kramer, Aunt Martha's China, 12, 22-23. 83 Milam & Munford Adventures of a Home Economist, 157. 84 Knight Biggerstaff papers, Letter, Camilla Mills to Family, April 17, 1923, box 25, #14-17-629. 85 Kramer, Aunt Martha's China, 123. 86 Wood, The China Letters of Mabel Wood, 121. 87 Milam & Munford Adventures of a Home Economist, 154. 88 Kramer, Aunt Martha's China, 13. 90 Milam & Munford Adventures of a Home Economist, 149, 163. 92 Knight Biggerstaff papers, Letter, Camilla Mills to Thelma, November 23, 1924, box 25, #14-17-629. This quote was copied from Helen Schneider's notes taken in March of 2008. Note: Hu Shih was a Chinese leader who was largely influential in the establishment of the vernacular as the official written language of China. 93 Milam & Munford Adventures of a Home Economist, 156, 214. Knight Biggerstaff papers, Letter, Camilla Mills to Family, January 14, 1923, box 25, #14-17-629. Knight Biggerstaff papers, 1949 Journal of Camilla Mills, box 35, #14-17-629. Kramer, Aunt Martha's China, 13, 20, 25, 51, 65, 118, 132. Wood, The China Letters of Mabel Wood, 20, 22, 35, 53, 72, 66, 88, 91, 122. 94 Kramer, Aunt Martha's China, 1. Wood, The China Letters of Mabel Wood, 47. 95 Milam & Munford Adventures of a Home Economist, 153. 96 Kramer, Aunt Martha's China, Prologue. 99 Milam & Munford Adventures of a Home Economist, 163. 101 Wood, The China Letters of Mabel Wood, 117. 102 Kramer, Aunt Martha's China, 28. 106 Wood, The China Letters of Mabel Wood, 59.